U.S. Navy Sends Ships Out To Sea Ahead Of Hurricane Florence Nearly 30 naval ships were ordered to leave the Hampton Roads area of southeastern Virginia on Monday in order to escape the storm. The guided-missile destroyer USS Nitze departs Naval Station Norfolk ahead of Hurricane Florence, in Norfolk, Va., on Monday. Evacuation orders from South Carolina to Virginia have driven more than a million people inland seeking to escape Hurricane Florence that is expected to make landfall Thursday. The U.S. Navy is seeking safety in the opposite direction, out to sea. Nearly 30 naval vessels left the Hampton Roads area of southeastern Virginia Monday in order to escape the ravages of the storm. Florence is expected to reach land somewhere in the Carolinas on Thursday, bringing with it heavy rain, powerful storm surges and high winds. The Navy ordered all ships to leave, also known as a sortie order, Joint Expeditionary Base Little Creek and Naval Station Norfolk, the largest naval base in the world, to ride out the storm in the open water. The idea is to avoid the storm altogether by heading out to sea away from the hurricane rather than have large ships and aircraft carriers stuck in port, being bashed up against the docks, says Rear Adm. John Meier, commander of the Carrier Strike Group 10. Meier is leading 25 ships off the coast of Florida aboard the USS George H.W. Bush. "A sortie order is just that it's a precautionary order to set our ships to sea where we have much more ability to maneuver and avoid the storm," he tells Here & Now's Robin Young. "And if you leave ships in port, there is always the hazard that a ship can be damaged, broken loose from its mooring lines or that our piers and infrastructure can be damaged as well." U.S. Fleet Forces Commander Adm. Christopher Grady ordered all ships in the region to Sortie Condition Alpha, which means they must quickly get moving. "Our ships can better weather storms of this magnitude when they are underway," Grady said in a statement. 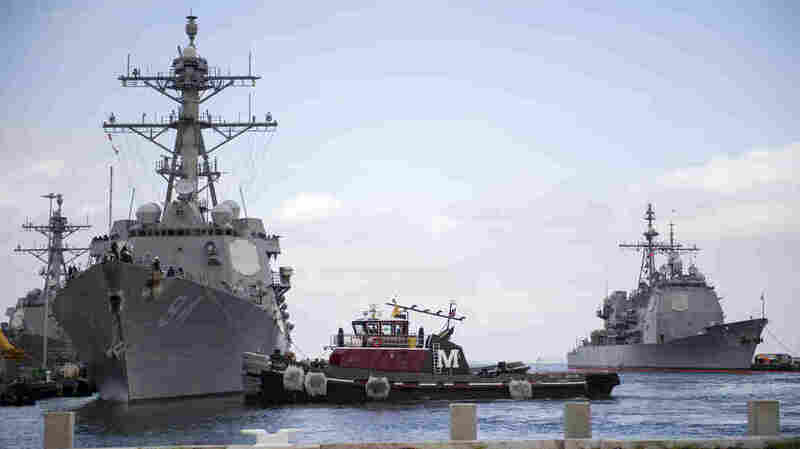 Back at base, the few ships left behind for repairs are being outfitted with extra mooring, have dropped anchor and disconnected power lines, according to the Navy. The Coast Guard also sticks around to prepare the area for the storm and be ready to launch rescue and cleanup efforts in the storm's aftermath, Meier says. "My residence has been sandbagged. The issue with dumpsters and other things is when you have high winds like that is you really try your best to prevent missile hazards," he says. "Anything that could get blown around or to prevent water intrusion into buildings all, that's being done on the bases and on our facilities." But when members of the Navy leave on a mission like this, their family members must evacuate or weather the storm on land, on their own. Meier, who has served for 32 years and been married for 25, says this is part of "the Navy way of life." "This is not the first time I've left my family due to a hurricane," he says. "My family met me in a liberty port in Guam years ago. A typhoon came in, and I and the rest of the sailors that were on board the USS Kitty Hawk at the time, we got back on board the Kitty Hawk and left our families in Guam, and they weathered out the storm." The U.S. military also evacuated the Marine Corps' recruit-training camp at Parris Island, S.C., which lies on a coastal marsh, and has begun moving fighter jets and other aircraft from the water's edge, according to The Washington Post. After the storm passes, the Navy ships will return to Hampton Roads and begin the process of reopening the ports, which includes inspecting navigational markers, buoys and surveying the depths of the channels, Meier says. "That's a relatively fast process for reopening the ports at least up in the Norfolk area," he says. "I would expect that that could be much longer or [a] more difficult process for places like Morehead City or Wilmington, N.C."
As for the status of those ships now, Meier says they are floating near Florida, far removed from the storm's path. "We're seeing beautiful weather, no rain, relatively calm seas down in the Strait of Florida right now," he says. "But I am certainly concerned about the storm itself. Florence has the potential to be an absolutely devastating storm."